We love artichokes. We love cheese. We love turkey burgers. This dish was a natural fit for us! I made this recipe ages ago, and for reasons unclear to me now, I did not include it in my blog. We completely fell in love with this burger all over again when I made it over the weekend - it would be a shame to leave it out a second time! I served the burgers on homemade whole wheat burger buns, and WOW. The combination was fantastic! We hadn't even finished our meal and we were fighting over who would get the leftover burger the next day. Katie calls for 2 pounds of ground turkey, but I find I can get by just as well with one. You can skip the cheese or choose a lower fat cheese, such as feta, to make this dish clean. -In large bowl, add ground turkey, balsamic vinegar, onion, garlic salt and pepper. -Work lightly with hands until well blended. -Heat grill on medium heat. In case your cheese starts to ooze out, a good preventative measure would be to line the grill with some non stick foil, poked with holes for drainage. -Divide meat into four portions. -Remove 2/3 of each portion and flatten into 4-5 inch patties. 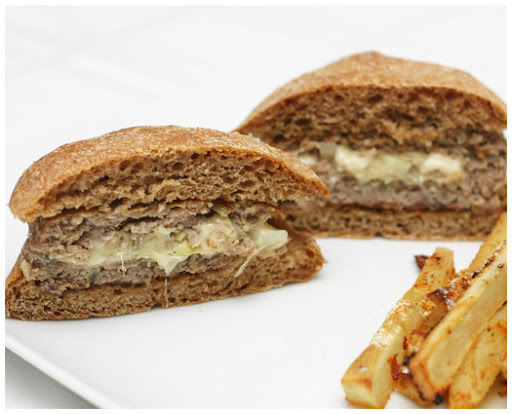 -Place 1 slice of fontina and two artichoke heart quarters in middle of each patty. -Lightly flatten remaining 1/3 of each portion into 3-4 inch patties and place on top. -Work lightly to flatten and seal all edges of patties. -Cook over medium to medium-low heat *without moving* burger until bottom side is browned and cooked through, about 8 minutes. -Turn burgers over and continue to cook until bottom side is browned and the burger is cooked through but not dried out about 8-10 more minutes. -Remove from heat, place on bun and serve immediately. These look very tasty! All our favorite stuff too! I love, love, love artichokes. What a great way to jazz up turkey burgers. Yum! Love turkey burgers and love artichokes...these sound and looks delicious!